Exercise sessions are an excellent way to stay fit and healthy, with Zumba having taken off as one of the most popular classes worldwide. 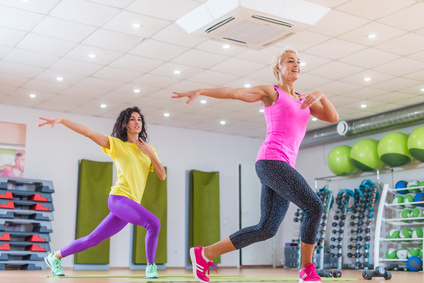 Dancing to great music in a fun environment burns through the calories and, while you don’t need much equipment to take part, we have written this buyer's guide to help you find the best shoes for Zumba class. Zumba involves a sliding type of dance, so you don’t want shoes with too much grip, but enough to keep stable. Zumba specific shoes will also have a spin spot to allow you to turn easily, and you’ll definitely need ones that are good at shock absorption. You will want lightweight shoes and, ideally, ones with split soles that have one sole for your heel and another for your toes. The important thing when looking for dance class shoes is that you choose ones that fit snugly around your feet. You also want them to be lightweight, breathable, and provide lots of cushioning and shock absorption- so very little pressure is exerted on your feet or ankles. Some shoes give extra support through various means like external heel braces, so if support is crucial to you, then you should look closer at those type of products. These training shoes by New Balance have been designed to work well in all dance and gym environments, and will provide you with the support and cushioning you need for an active dance class like Zumba. The outsole is made from a non-marking rubber, and provides just enough grip to stay steady without interfering with the dance moves. Cushioning is provided to your feet through a number of methods. The dual density collar puts a soft density foam against your foot for comfort, and a firmer density foam behind it to increase support. The EVA foam footbed and midsole give you a firm and shock absorbent cushion for your feet. If you’re looking for your new shoes to be comfortable and sturdy, but that also can be used in all areas of your workout regime, these ones will be well worth looking at. These crossfit shoes from Reebok are ideal to use in a wide range of classes and routines, and are great for the dance styles used in Zumba. The material that they are made from fits snug around your feet and is stretchy- so it does not limit movement. By incorporating Kevlar into the upper the shoes are strong, which gives you heightened levels of support. My favorite feature of these shoes, though, is the nano shell that is attached to the midsole. This gives an added layer of support to the area, acts as a shock absorber, and helps with airflow and durability. These shoes are available in a wide range of colors to suit your taste, and will be a great choice as the best dance shoes for Zumba classes, especially if you go to other classes too. Reebok have made these shoes to be practical in all class environments, and they’d be perfect for the range of motions required for Zumba. The sole will grip when you’re staying steady, but easily slides when you need it to. The memory foam insert ensures your feet are comfortable within the shoe. The EVA midsole is lightweight, and the outer material is stretchy so it doesn’t restrict your foot movement at all. They have a good looking low cut design, which also helps avoid putting unnecessary pressure on your ankles when you’re landing on your feet. They also have extra toe room so you don’t feel cramped while wearing them. If you are looking for a shoe with a bit more grip than the others, while still maintaining freedom of movement and comfort, these ones could just be the best shoes for Zumba class for you. These training shoes from Nike will make you stand out in a crowd with their loud design, and are available in a wide range of sizes and colors. They fulfill all your needs for Zumba classes by keeping your feet cushioned and supported. The dual density midsole puts a soft foam layer against your feet to keep them comfortable, while a sturdier layer is added to provide support. The fabric stretches a little to allow your feet in, and will snugly fit back around them. This gives a great feel, which with the flywire midfoot technology that keeps the shoe firmly in place around your feet will give you the confidence for all elements to the class. The heel is firm to absorb the shocks when landing back on your feet, and the sole offers just enough grip to stay stable, but also allowing the sliding motions that Zumba classes require. These shoes from Jackshibo have a unique design that will definitely stand out and be unique in class. They provide your feet with a good level of support for all the different movements that are involved with Zumba classes, and have cushioning to ensure your feet stay comfortable, even during intense sessions. There are lots of different color options to choose from, so you’ll likely be able to find a version that suits you, and they are available in a wide ranges of sizes to cater for men and women. The platform height is 1.18 inches, so you will be close enough to the ground to be able to effectively move and maintain full control. The rubber sole applies just enough grip to be the best shoes for Zumba workout classes, but will be good for other activities around the gym if that’s what you need. The flexible, waterproof, breathable woven fabric these shoes are made from will keep your feet feeling fresh and dry. This also means that these shoes can be worn indoors and outdoors in all types of weather and, no matter what conditions you face, your feet will be protected in style. They are also the lowest price of any of the shoes in these Zumba shoes reviews. This means some comfort features are missing that you’ll find elsewhere, but this doesn’t prove detrimental to the overall feeling at all. If you are looking for something a little different and low priced while still receiving a good level of support, shock absorption and comfort, then these shoes could be the answer you are looking for. These shoes have been designed by New Balance to provide support and comfort to your feet without being a hindrance. The lightweight construction ensures they won’t become a drag on your feet after an energetic class. The Cush + Midsole allows your feet to snugly fit into the shoe and provides a nice padded comfort as well as strong support. The padded tongue and collar are a comfortable surrounding that protects your feet from rubbing. The rubber sole will slide nicely as you dance by giving just the right amount of grip. The inside cushion provides shock absorption and extra padding, but is removable if you’d prefer to use a different insert. They are available in a wide range of colors to suit your taste, and have a rear pull-on strap to make them a lot easier to put on and take off after a long workout. RYKA have designed a lightweight and comfortable shoe that is suitable for use across most classes and activities at the gym. They provide a snug fit around your feet and the rubber sole provides a nice amount of grip that still lets you slide when you need to. The dual foam midsole provides a layer of soft foam against your foot for comfort, while firmer foam is used to add structural support. The removable precise-return sock liner will also add to the comfort as well as helping your feet feel fresh and moisture free. The fabric this shoe is made from is very flexible, so it will stretch with your feet as you move about. This gives you full support without inhibiting your movement at all. They are available in a good selection of colors too, so they will suit any style. If you are looking for the best Zumba shoes that will also be great for other exercises, then these ones from Asics are worth considering. They are made from light, durable, and flexible materials, and have a supple rubber sole that works with a wide range of uses. The breathable material that the upper is made from will keep your feet feeling fresh and cool, and the ultra lightweight design will keep additional pressures to a minimum. GEL cushioning in the heel and the external heel cage adds an extra level of comfort and shock absorption, and the Mono Sock fit system will make sure your feet are firmly secured within the shoe. These shoes are slip on, with a pull hoop on the heel, and are available in a good selection of colors and sizes. The sole gives a nice amount of grip, but is designed to easily move in different directions and on the spot. These shoes are what you would expect from Puma. They are comfortable, provide good support and bounce, and a sole that works in most environments. As far as Zumba classes go, you’ll have the confidence in this shoe to fully commit to the most energetic routines. The breathable side panels are there to keep your feet feeling fresh and cool. The padded tongue, collar, and cushioned midsole work together to make this shoe feel really comfortable, and the high rebound EcoOrthoLite sock liner helps use your energy efficiently and have a wide range of motion. The leather and fabric design looks great in both of the color options, and the rubber sole gives you just the right level of grip for your class. If you choose to buy these shoes, make sure you carefully look at the sizing, because some customers have mentioned needing to get half a size larger than you normally would. Zumba is a really fun class to take part in, and it is no surprise that it has become so popular. You don’t need any special equipment to dance, but finding the right shoes can help protect your feet, conserve energy, and provide you with support and stability. Our choice for the best shoes for Zumba workout classes is the Asics women’s GEL-fit Sana. They add extra support and cushioning, and the GEL inserts are great at shock absorption to reduce the loads being exerted on your feet.